The Essentials color sort utility has been updated in 1.155 with a new patent-pending process. It now can open a new view with the sorted file, and we’ve created another World’s first by making the color sort intelligently aware of stacked applique. We’ve got a new video up showing the basics. First we make a stacked applique design. Not infringing on any trademarks here, so not too detailed. What you can see is the left ear is followed by the right ear, which is followed by the orange face, and then the nose is last. That’s how we want it to look. These are StitchArtist objects, so the program knows they are applique. The color style is the old-fashioned Brother applique colors, except for the face, where we used the ‘Keep Stop’ style in the StitchArtist pane. 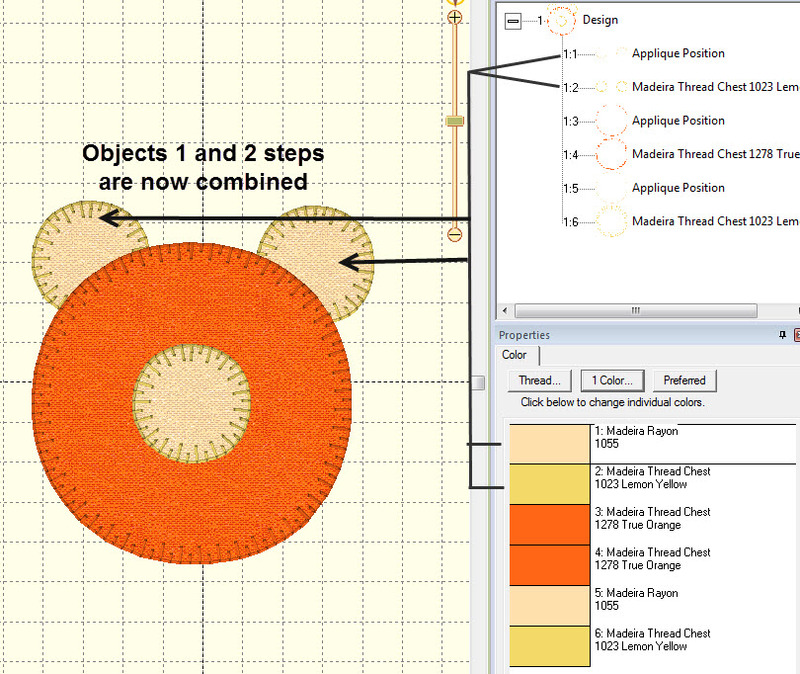 We did this so that you could ‘see’ the orange in the fabric simulation. If this were a set of designs brought in from elsewhere, you can right-click or left click on the colors to set their applique status within the program. Let’s color sort. 2 colors were removed. Thinking it through, what would those extra colors have been? Can you guess? 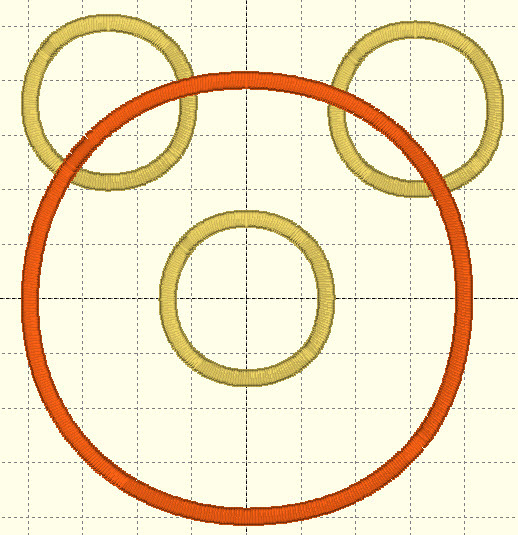 Here we can see what was sorted together: The two ‘ears’. This is because they did not overlap, and they used the same colors, so they could be appliqued at the same time. The face sits on top of the ears, and the nose sits on top of the face. Those layers could not be sorted together because the fabric would hide some layer if they were. The program ‘sees’ the fabric layers as filled, preventing those layers from getting in the wrong positions. Suppose you wanted to lay all the position colors down together, regardless of layering. Could you? Yes, of course. One way is to not have any of these marked as applique. 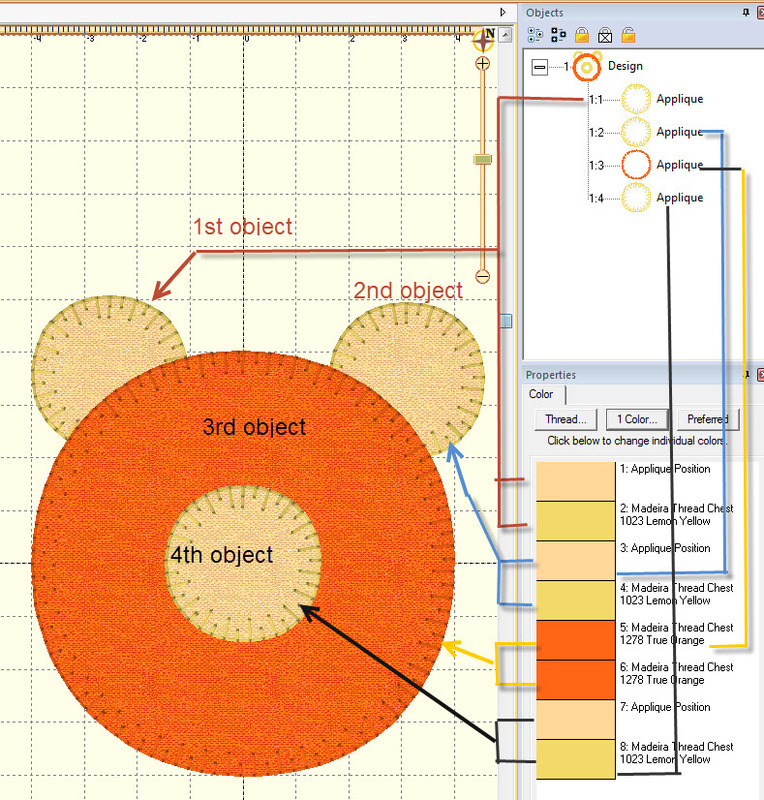 Or, you move the objects using the Object View on the right. Why would you ever want to do this? If you are not top-stitching individual pieces, rather doing embroidery over the whole stack. 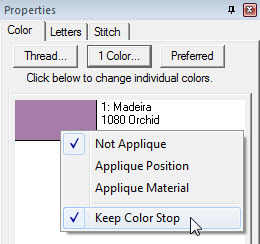 For times when you want two sequential colors to be the same, yet still have the machine stop, there is a new ‘Keep Color Stop’ available on the color chip when you right-click (the same as when you set applique position/material). Most machines honor the stop in our testing, but on some older multi-needle machines, you may still have to reserve the stop on the machine (hand icon). This setting only means something when this object follows something of the same color. It prevents the program from combining the objects in the output to the stitch file. If you remember to save your working file, this setting can always be changed. Remember the ‘Remove Hidden Stitches’ button on your toolbar? This is one of the most used features we have created, and with our patented process, it works on applique too! Let’s not forget that you can remove hidden stitches before color-sorting. 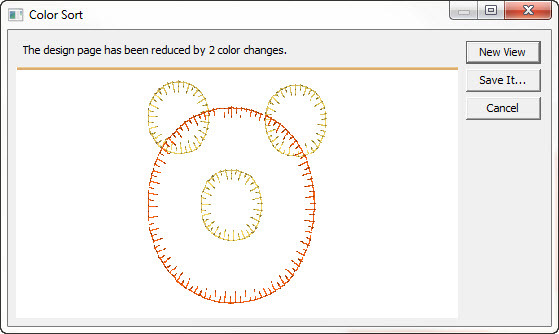 Normally, when you save a design the program will remove hidden stitches for you automatically. But when you sort an applique, you might want to remove any hidden top-stitching first. Do you remember what this does? 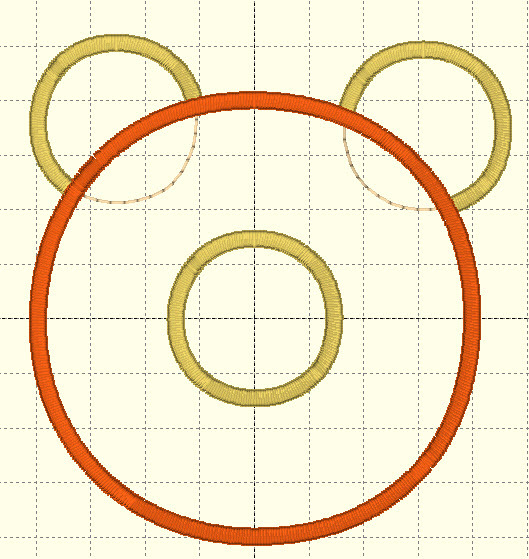 Here is our applique design with satin stitching, like a normal applique you might download. See how the satin stitch goes under some of the later applique layers? We’ve turned off the fabric preview so you can see what’s going to happen. Once you remove the hidden stitches, the program leaves the running stitches of the applique, but removes some of the satin, which would create a ‘bump’. Hope you enjoy the new color sort. Happy Stitching! Posted 2 years, 4 months ago at 7:12 pm.